Can religion and science co-exist? Is there common ground between what fundamentalists believe about God and the creation of the universe, and what science has taught us about the universe and its origins? In the 21st century, we can certainly answer that question a little more definitively than we could in the 1920s.In the 1920s, there was a real debate about religion and science and which should prevail in the education of children, and the flashpoint came in July 1925 with the famous Scopes Monkey Trial, which was immortalized in the book and play titled Inherit the Wind. The Scopes Monkey Trial was a legal clash between Darwin’s theory of evolution and the Biblical account of creation as being antithetical. 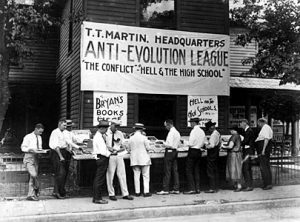 Earlier in 1925, the Tennessee state legislature passed what was called the Butler Act, which prohibited the teaching of evolution in any state publicly funded school. John Scopes, a high-school science teacher in Dayton, Tenn., worked with businessman George Rapalyea to test this new law by launching a conspiracy to violate the law and put it on trial as an unconstitutional violation of the First Amendment. To make a spectacle of the law, the ACLU joined in the defense of Scopes and wound up enlisting famed defense attorney Clarence Darrow to for the defense team for the trial, which was to be held in the tiny town of Dayton. Darrow joined the cause after the prosecution brought one of the Fundamentalist heroes of the time, three-time Democratic presidential nominee William Jennings Bryan, to represent the prosecution, despite not having tried a case in more than three decades. It seemed like a death sentence. Because of the names involved, and the thought of religion being attacked in a Bible-belt state like Tennessee, a large crowd of spectators and national media descended on Dayton for what turned out to be an eight-day trial that discussed evolution and the Bible. After the judge shot down the defense’s primary argument challenging the constitutionality of the law by keeping the focus of the trial on Scopes and his alleged violation, Darrow pretty much had his hands tied. Even some scientific witnesses, who would have testified to the theory of evolution, were not allowed to testify. Eight days of the trial led to less than 10 minutes of jury deliberation, and Scopes was found guilty of violating the Butler Act and was ordered to pay the minimum $100 fine (which is near $1,400 in today’s dollars). The case was appealed, and the conviction was overturned on a technicality, as state law prevented judges from unilaterally imposing fines of more than $50; the jury was supposed to impose the fine of at least $100 according to the text of the Butler Act. Though Scopes was not called to the stand during the trial, he did say publicly afterward that he was not sure that he ever taught evolution in class, but the fact was not in dispute during the trial, which led to the conviction. While Bryan, the fundamentalist Christian, won the case, he was publicly humiliated during the trial when Darrow took the unorthodox step of calling Bryan to the stand as a witness and spent two hours exposing Bryan’s Christian beliefs and his ignorance of science (at the time) and his literal interpretation of the Bible, which was already being heavily questioned by scholars around the world. By the way, the Butler Act remained on the books until 1967, and these kinds of laws were banned altogether by the U.S. Supreme Court in 1968, which ruled a similar law in Arkansas was unconstitutional as a violation of the Establishment Clause of the First Amendment. Previous Previous post: Why Is Amelia Dyer One Of The Most Notorious Serial Killers In History? Next Next post: The Lindbergh Baby Kidnapping: The Right Man?